We left Idaho on Monday morning in the pouring rain! 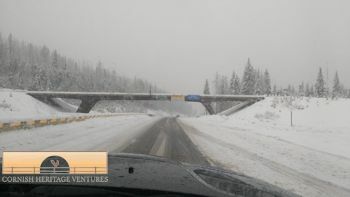 Richard, knowing that we would likely hit snow on Lookout Pass on the Idaho/Montana border, decided he would drive as he felt that everyone would be happier that way 🙂 (I drive a little faster than him!) As we started climbing the pass on the Idaho side the snow plows had done a fantastic job. (Earlier in the morning chains had been required.) However as we came to the top (see pic) the Montana plows were not quite keeping up as you can see. We had been praying that we would not have any troubles nor need chains as really did not need that expense. As we came down the pass, the semis were lined up on the other side putting chains on! Thanking the Lord that we got through safe and sound. Made it to Cardwell, on the other side of Butte so a good day’s journey.